time, and choose the perfect one for you! best of all, it won't cost you anything! process. We schedule viewing and accompany you, help complete the paperwork, negotiate the lease terms, everything until you acquire a place. Just like any standard rental, to qualify you will need a Letter of Employment/ Proof of Income, a Credit Check and First and Last month rent.. Additional information may be required for students and those without credit, such as a guarantor/ co signer, or proof of savings/ osap. All rentals require a Minimum one year lease. Feel free to call or email us anytime if you have any further questions. Get one of our professionals to Rent Out Your Apartment headache free and for Maximum Rent Value! We Screen Tenants, Do Credit Checks, Book Viewings, Prepare the Lease Agreement, Collect Deposit, absolutely everything until the the end. Welcome to Toronto Apartment Rentals Online! and best of all, it won't cost you anything! 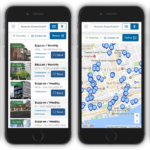 Select location and search rental listings. Save to Favorites the ones you want to view. Send us your Favorites List to schedule viewings with a professional Realtor. Simply send us your requirements via the Contact Form and we will email you a complete list of the available listings.